Are seeking for fund ?Join our peer to peer charity giving program to get help for your urgent needs!! - womencaregroup's JimdoPage! We are world wide organization branch in South East Asia Cambodia and we place volunteers directly to our own projects. We therefore do not have to pay for any other agencies or organizations. We have mainly local staff and volunteer; do not have to spend that much for the operation cost. Our full time staffs also do not make 6-figured salaries; and we work very hard and smart to keep costs down especially for you the volunteers where it counts the most. Are seeking for fund ?Join our peer to peer charity giving program to get help for your urgent needs!! What most charities don't do is they won’t follow the traditional olden day’s way of charity giving we are now focused on all relative aspects of charity works including the WCG101-PTPSNACGP WOMEN CARE GROUP 101 PEER TO PEER SOCIAL NETWORKING AND CHARITY GIVING PROGRAM. With a conclusive and better understanding of human nature we have made an innovative way and approach towards delivering the best and less time consuming ways of getting help online through our genius charity since we understand why privacy is important therefore we have set up this program to tackle pressing cases which victims often hide. Most people will not tell their friends or family their problems because of shame or sometimes pride. We have decided to encourage and provide a way which anyone with a pressing problem could easily come and discuss with individuals who are willing to assist. The people in our board and groups are real people and they are also involved in our charity cause. The peer to peer social networking and charity giving program is meant for members who are interested in either seeking for a micro-loan or donations to solve their various problems such as business investment, educational, travelling and holiday vacation, health reasons, social gathering , wedding party or other projects e.t.c. 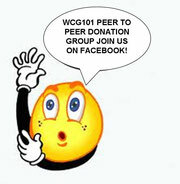 The social peer to peer charity giving program users of the site can now donate specific amounts of money to WCG101-PTPSNACGP users. Before you will be fully registered as a member you must like all our facebook pages, reason is to create as much membership and fans so we can easily spread our act of giving through you. You must add your real life friends to join you its easy just invite your close friend to the group through your email or facebook add friends tab. WCG101-PTPSNACGP works when members decided to donate for a particular cause within the members this decisions will be entirely based upon the member’s agreement to help a fellow member who needs urgent help. We also provide minimum members external donation link for our staffs who work hard to make this project come true and also to keep our site running . To send your donations to our staffs that keep our website running please click on our donation links donate, remember no amount is too little. GENERAL INFORMATION FIND OUT MORE.